Any one of us has at least one unique recipe that is kept in a family’s secret formula box that involves with chicken wings. I still haven’t had one yet and today recipe officially becomes THE family recipe. The only difference is instead of keeping this secretly in a box that is hidden somewhere in my house, I decided to publish it online for easier editing and updating (if needed). Also, sharing is caring, so why would I hide it anyway? These twice cooked wings will for sure bring you the most crispiest and tastiest wings. However, they will not be fluffy like the usual wings you have in stores because there is no flour or leavening agent involved (in fact, I know there are a lot of people love not to have these ingredients in their wings, if you’re one of them, you’re welcome. First, I simply marinade wings with equal part of salt and sugar. Then I steam and let them chill completely in refrigerator. With this steaming process, chicken’s skin will get very dry after chilling which helps to make a super crispy wings. If you’re in a hurry and want to make your chicken wings as soon as possible, my tricks are to dry them thoroughly with paper towel and let them cool down at room temperature for 30 to 45 minutes. Finally, I deep fry these steamed wings on medium-high heat for 5 minutes or until the skin become gold brown. Put equal amount of salt and sugar in a small bowl and mix well. Use about 1/4 c of salt and sugar mixture to marinade chicken wings for at least an hour (maximum 6 hours). Preserve salt & sugar for future use. In a mean time, make sweet and spicy sauce: in a small non stick pan, combine palm sugar, fish sauce, lime juice and cook over medium heat until sugar dissolve completely. Remove the pan from heat, stir in Sriracha and let the sauce cool to room temperature. Set up a steamer. After marinade wings, discard any excess liquid. Arrange wings in the steamer and steam for 30 to 40 minutes. Chill wings completely in refrigerator (from 1 to 4 hours). The drier the wings, the crispier they become when frying. If you’re in a hurry, 1 hour chilling should be ok. Deep fry wings (on high heat) in a shallow pot or pan for 5-6 minutes or until the skin is crispy and turns golden brown. If you want your wings softer, you can fry them for only 3-4 minutes and do not let them turn golden brown. 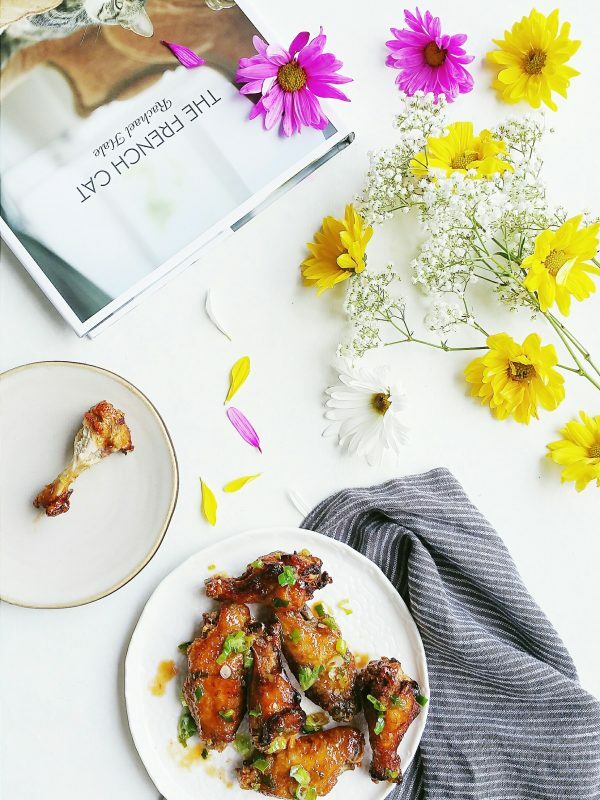 In a medium mixing bowl, toss 4-5 wings with 2-3 tbsp sweet & spicy sauce and 1 tbsp scallion oil. Serve hot. Enjoy!